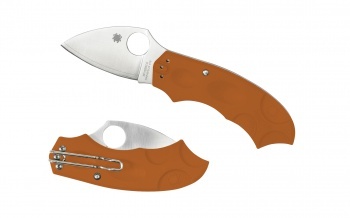 Spyderco Meerkat C64JPBORE Burnt Orange. Meerkat is a Sprint Run. It has a Phantom Lock™ mechanism, it is hidden in the handle. Just slide it up and the blade is released and once fully opened it will lock into place. Handle is made of FRN- fiberglass-reinforced-nylon that is injected with a burnt orange mold color. There is a silver deep-pocket wire clip that is reversible for convenient left or right-side tip-down carry. Blade is 2.02 inches long and is made with three-layers: laminated blade with a HAP40 core and SUS410 stainless steel outer layers. Traditional finger hole on the blade with Spyderco logo. Do you own Spyderco Meerkat C64JPBORE Burnt Orange? Tell us about it! Have a question? Ask!